First of all: there is still a lot to discover! 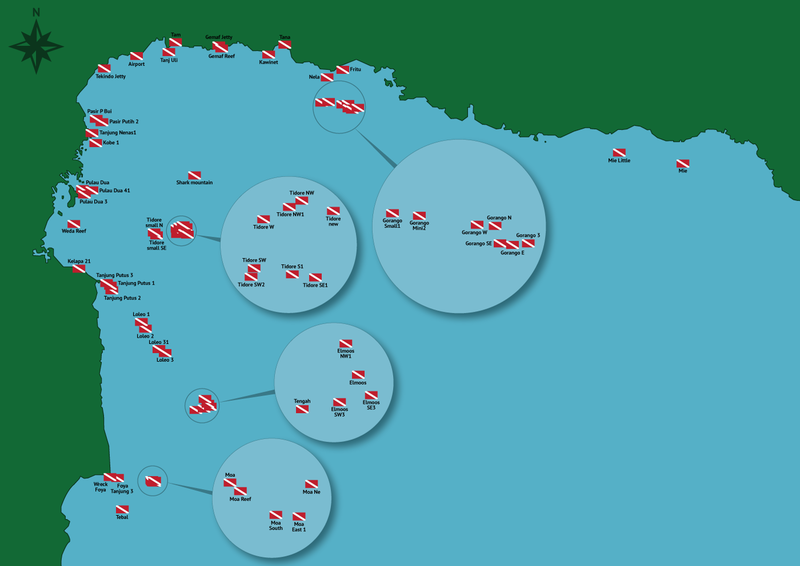 Below you can find an image of the dive sites, and a description of some of our favorite ones. The shore of Weda Resort. Just walk in. Very good, shallow dive, if it has not been raining too much or waves hit the beach. The depth is from 2 – 8 meters. You will find beautiful corals and much fish. Specials: seahorses, big lobsters and often small black tip sharks. The house-reef is a no catch zone since April 2011. Depending on the weather conditions and waves the visibility is 1 – 15 meters. Means white sand and that is what you will see from the boat. Under the surface the incredible coral garden starts at 3 meters depth. The site offers pygmy seahorses and long nose hawk fish, but also schooling jack fish and bump head parrot fish. It takes only 5 minutes by boat to get here. This is why we often call it our second house reef. Prepare for a long, easy going dive. Viz 5 – 25 meters. This site is a long shallow stretch of coral reef along the North shore of Weda Bay. This is a perfect place to see glassfish, cardinal-fish, and some hundred other species. Like Pasir Putih, a site with a good chance to spot the endemic Halmahera Walking shark. Distance from the resort: 10 minutes. Both during the day as at night-time, you can do muck and critter diving, although being it without garbage. The guide will help you to spot the Bobbit Worms, Seahorses and other creatures on this black sandy bottom. Distance from the resort: 10 minutes. As at most sites the coral reef starts here direct under the surface. The diversity in both soft and hard corals is enormous. The over sized table corals are home for millions of glass fish. Bigger fish, such as Black Snappers, Emperors, Bump head parrot fish and more can be seen at snorkeling depths. Distance from the resort: 20 minutes. This underwater mountain, which is situated in deep water, 11 kilometers from the nearest shore, has it shallowest spot at 31 meters (100 feet). We attached two lines to the bottom to make descending and ascending comfortable. Until now we hardly ever had a dive without sharks here. Further, schooling Jack fish, Barracudas, Napoleon wrasses, Tuna and much more of your wish list. A rather strange dive site. Here it is very easy to see how coral can grow in huge formations, then die, and form the base of new corals, and so on. Big sponges make the landscape an even bigger adventure. Distance from the resort: 30 minutes. Excellent day and night, critter dives on this Lembeh Strait – like substrate. Distance from resort: 30 minutes. Big schools of fish are hunting or being hunted on the slopes with white sandy bottom and coral formations. Especially the shallower parts with excellent corals and huge sponges invite to make very long dives. Distance from the resort: 35 minutes. In front of our old resort you can make good black sand, critter dives. Distance from resort: 40 minutes. This offshore reef is a very good place if you want to see a lot of fish; including schooling Oceanic Trigger-fish. Distance from the 45 resort:minutes. Btw. Gorango is the local word for shark. Same, but different, as small Gorango reef. This big reef system actually offers much more than one dive site and it deserves some more exploring. Distance from resort: 50 minutes. These coral gardens are at the West shore of Weda Bay. Visibility is not that good, but there is a lot to see. Distance from resort: 15 minutes. The shore south of Weda Resort, until Weda city which lies at 12 kilometers distance, consist mainly of mangroves with tenth of small island and shallow bays. Some days the visibility can be quite good there. You will experience a total different landscape, above and underwater. Distance from the resort: 20 minutes. We dived only some parts of this extended compilation of slopes, shallow coral gardens and small, steep walls. Every time we are impressed with the healthy and undamaged condition of the corals and sponges, even in depths as shallow as 3 meters. Distance from the resort: 25 minutes. This is again, a very nice off shore reef where you will see much diversity and big schools of fish. In the shallow you can look successfully for octopuses. Distance from the resort: 30 minutes. Although is has the same name it is about 2 kilometers away from the following Tidore reefs. Greater Tidore reef, East side. Wonderful coral gardens with small walls. Loleo 1, 2, 3 and 4. Elmoos Reef (N.W., North, S.W. S.). Most of our guests thought this is the best steep reef they ever visited. Both for diving as for snorkeling. The offshore, atoll shaped, reef is big enough to make 6 dives at different spots. The shallow reef top is overall in very good condition. The dive sites are all steep walls with countless caverns and caves. At most sites the white bottom is at 35 – 45 meters depth. This causes good light conditions on the walls. It is a 45 – 60 minutes boat ride to get there. Japanese WW II shipwreck. We discovered this in 2014. The 35 meter long steamer is an excellent condition. Depth 10 – 30 meters. Ship has been used as a sub-chaser. This reef we discovered also recently. The corals are only at some parts of the reef in good condition. But during all dives we spotted many (up to 20) blacktip, whitetip and grey reef sharks.